Would you finally feel confident enough to make career happiness your top career priority? Every day, HUNDREDS of amazing jobs are being created, and they're greeted by thousands upon thousands of eager applicants. Why aren't you first in line? Whether you’ve spoken with recruiters or submitted your resume for a few potential options, the success of your job search rests heavily on your answer to this question. You've probably been asked this a hundred times. It's one of the first questions you hear when you meet someone new. People ask it with the best of intentions. It can strike total fear and shame into the heart of just about anyone. Especially when you KNOW you're not where you want to be in your career. And even more-so if you've been TRYING to change your situation but haven't been able to make it happen yet. In my mind, there's no question more anxiety provoking for someone who wants to make more out of their career. I still remember how much pain this question caused me early on in mine. I was a graduate school dropout. But I wasn't landing any interviews, let alone any offers. It was that this question came up over and over again constantly reminding me I wasn't where I wanted to be. I'm grateful people asked it. Grateful people are asking it to YOU. Because that single question... and the ACTIONS you take to finally be able to answer it with unshakeable confidence, hold the key to your career happiness. It's normal to feel scattered or confused about your career interests. What's out there, what's within reach given the skills you've already developed in your career, and is there a career path that would make you truly happy? Digging into each of these questions is like opening Pandora's box. Without the right direction, you could be searching for an answer till the end of time. The truth is, there's no one right answer. There are a variety of career paths that could make you happy! If you're like the rest of us, you are a multi-passionate person with tremendous capacity to learn and grow in the direction of your dreams. But it's about identifying which career paths are worth exploring, exploring them efficiently, and choosing the right one to go after in the best possible way. Confidence to double down on a plan of attack -- a systematic approach for assessing what's right for you and making a decision that gets you excited and motivated to navigate your way to the finish line. You never wanted to job search (who wants to job search)? So when you got started, you were fully committed to being organized, thoughtful, strategic, and making it through your search in the least amount of time. Update resume, peruse the job boards, find jobs you want to apply for, draft cover letters, submit applications, and wait for the interviews to come rolling in. You feel like you've done everything right. But nothing’s panned out. Worse still, all that energy you had when you started your search is depleting, fast. And you have no idea how to break through and make all your time invested worthwhile. The problem is, the job search of yester-year doesn’t work anymore. You're up job search creek without a paddle. To leverage a small but powerful set of strategies proven to produce results in today's job market (not yesterday's!). You started this whole job search thing with a full tank of motivation, genuinely excited to take your life by the reins and make it great. Unfortunately, you’ve never stayed committed to a strategy long enough for it to produce a steady stream of interviews and offers. But the secret to a successful job search -- one that lands a job you love -- is follow through. Accountability to stick to a consistent strategy, one that yields tangible progress week to week and the continued motivation you need to make it across the job search finish line. Job searching is damn scary for just about everyone. It can feel like a bit of a gamble. You’re afraid of making bad bets and having to suffer the consequences of having nothing to show for all that time and energy and passion you’ve invested. But secretly, you also know that if you truly commit to the process, and if you do it right, you will come out on top. An understanding of how to invest your time and energy in the right places. You need a strategy to follow that you can trust -- one that will quash those fears and make clear that the only risk you're facing is NOT chasing your dreams. I’m guilty of this too. I said similar things to myself after I dropped out of grad school. These are our inner demons talking -- they’re pointing out all the reasons we DON’T deserve our dreams. And I gotta tell you, if I could, I’d take every one of those inner demons out back by the dumpster and kick the crud out of ‘em. If you want it badly enough, your dream is almost always within reach. No professional has a picture-perfect background, and there ain’t no background you can’t overcome with the right approach and dedication. Imagine yourself sitting down with your feet up on the desk. You feel calm, and self-assured, because you know exactly what you’re going after in your career. You feel proud — of your resume, your LinkedIn profile, and the strategy you’ve put in place to pursue the job you want. The interview requests are flying in, and you feel ready to go in there and nail any interview question that might get thrown your way, and to negotiate for the offer you truly want and deserve. You think about job searching, and somehow, you smile. Because you know that you have what it takes to make it to the other side with your confidence and joy intact (and without losing your mind or all your free time in the process). You know, deeply believe, and trust that you can and will land a job you love in just a few short weeks. What if I told you this is 100%, absolutely within reach for you today? I’ve seen it in the thousands of job seekers I’ve coached: If you change your approach, you CAN experience a job search filled with momentum, results, & happiness. All you need is a simple system. A system that takes all the guesswork (and losing strategies) out of the process, gives you the personalized, ongoing support you need, and propels your search forward to success. The complete A-Z blueprint for finding career clarity, landing more interviews and offers, and making sure you come away with a job you truly love. 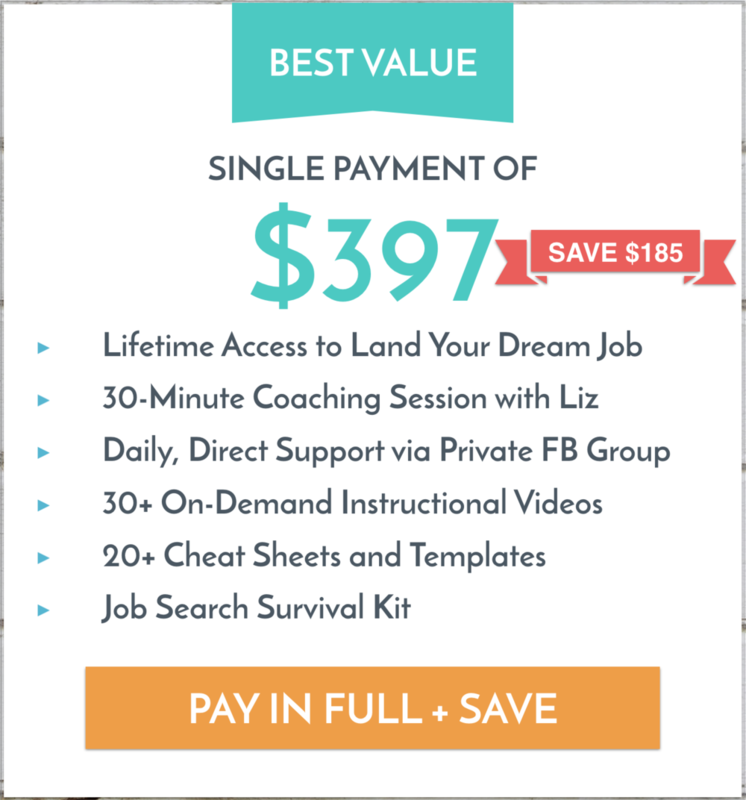 LYDJ combines video instruction, weekly exercises, and personalized coaching — taking the headache and heartache out of the job search, and helping you nail every step of your transition with ease. My personal Formal Interview Prep Worksheet that takes all the stress out of interview prep and allows you to focus on showing up as your best self. To bolster your job search success, you’ll receive intensive, 1:1 coaching time with NSC’s Founder & Head Coach, Liz Cohen. LYDJ Members use coaching to help them decide on the right career path, refine their resume and professional brand, develop a networking strategy, role play informational and formal interviews, prepare for complex negotiations, or knock down any job search roadblock to their success. As an LYDJ member, you get direct access to ME to answer all of your ongoing job search queries via our Private, Members-Only Facebook Group. I’ll give you feedback on your resume and cover letter, help you respond to challenging situations, and cheer you on every step of the way. how do you join lydj? And because we are constantly improving upon and adding to the LYDJ course with bonus videos and content (that you receive lifetime access to when you join) it will never be this inexpensive again. If you're ready to land your dream job, there's no better time to commit than right now. I give you a full 2 months to go through the training, implement the systems, and hit PLAY on your career transformation. If you're unsatisfied with the course in any way, I'll give you a full refund within 60 days of purchase. No questions asked. Seriously. I do this because I know what it feels like to be a cash-strapped job seeker, and I wish an option like this would have existed when I was struggling. You deserve an opportunity to put LYDJ into action and experience how easy and exciting it can actually be to go through a job search filled with momentum, confidence, and JOY. + What if I don't know what my dream job is? Not to worry! Week 1 of the course takes you through the process of defining your dream job before we show you how to land it. You'll use concrete exercises to define your values, passions and work preferences (your 'VPPs'), and then use those VPPs to identify strong-fit career paths and choose the one you want to go after. Past LYDJ participants constantly tell us that understanding their VPPs has become a core part of their career clarity and continues to help them make career decisions big and small. So even if you already know what career you’re going after, you have important insight to gain in Week 1! + What if I don't believe there's one right job for me? Then you're ahead of the game! We live in a rapidly changing world where 65% of the next decade's jobs don't even exist yet. And if you're like the vast majority of professionals, I know you are a multi-passionate person who could be happy in a variety of careers. Week 1 of this course will teach you how to identify the variety of careers you may be interested in, and then how to narrow down that list and identify the career step you want to take NEXT. You'll master this process and become prepared to navigate all of your future career decisions with confidence and ease. + How does this course differ from NSC’s free resources? There’s a LOT of new content in the course: exercises, techniques, worksheets, cheat sheets, and bonus videos you won’t find anywhere else. Yet interestingly, what many LYDJ participants told us they needed most from this course is the structure, accountability, and focus that propelled them to make week-to-week progress and to stick with their search until they could gleefully say “yes” to an offer. This course gave them the motivation to say “I’m going the spend the next 9 weeks making it happen,” and then do it. It’s grounded in the research: when you financially invest in something, you’re more likely to follow through. It signifies your commitment to making change happen, and paves the way for you to stay true to that commitment rather than dipping in, getting overwhelmed and then putting your career happiness on the back burner once again. So if you want to give your transition (and career happiness!) the greatest chance of success -- and to come away with a job you truly love, a salary you deserve, and new skills to make you and all of your future job searches stronger -- this course is 1,110% worth the investment. + What if I try the course and it isn't for me? We're confident that if you do the work, you'll see serious results -- you'll get more interviews, more offers, AND you'll see all of the personal developmental benefits we've promised above as well. 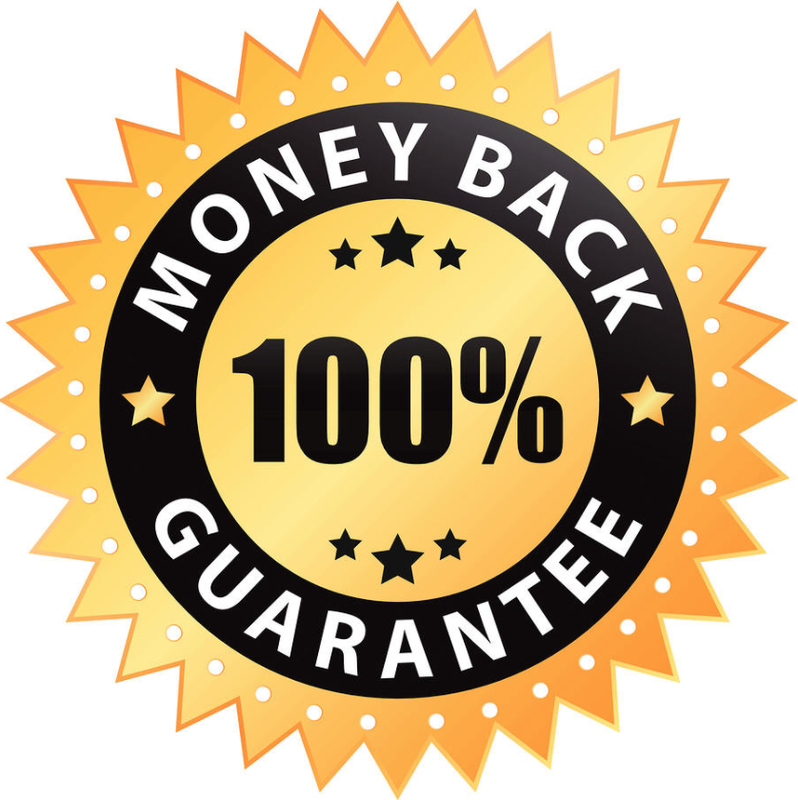 And we're happy to back that up with a risk-free, 100%, ironclad, money back guarantee. If you are dissatisfied with the course for any reason, you have a full 60 days from purchasing to request a full refund. + Am I guaranteed to get a job? If you do the work -- you stick with the training, follow the modules, and put your full heart into this process -- you WILL get more interviews and offers. But more importantly, this course will teach you how to find career clarity and ensure that you don’t just get “a job,” but a job that’s aligned with your values. It will teach you the skills you need to be a master networker, interviewer, negotiator, and overall communicator. And it will help you become more confident in who you are, what you want, and your ability to make it happen. And I can't emphasize enough that this is a risk-free decision. If you are dissatisfied with the course for any reason, you have 60 days from purchasing to request a full refund, no questions asked. Truthfully, the only risk you should be concerned about is not investing in yourself and making the decision to finally start creating the future you want and deserve. + Is this course for a certain age group or industry? This course is for all ages and all industries! We’ve distilled the best practices for any job seeker navigating the modern day job search, and we give you concrete guidance on how to apply these practices to your specific background and needs. The course has helped and received rave reviews from job seekers of all backgrounds -- recent graduates, mid-career professionals, stay-at-home parents transitioning back into the workforce, professionals with 20+ years of experience who are struggling to figure out their next career adventure or how the new way of job searching works, professionals who have recently been laid off or let go, and professionals interested in making a significant role or industry shift. The job search process has changed dramatically since the advent of internet recruiting, and we've invested a lot of energy in figuring out what works, so that no matter your age or background you know what you need to do to succeed. + Who is this course NOT right for? If you're a C-Suite or Executive-level professional, this course is likely not for you -- you most likely already have the skills, brand and network that this course helps professionals build. If you're someone who expects a head hunter or recruiter to present you with a golden opportunity without doing anything more than updating your resume, this course is not for you -- while this course does teach you how to craft a resume and LinkedIn profile that increase your chances of getting noticed by recruiters, more importantly it teaches you the networking techniques responsible for 85% of hires, and the interview and negotiation skills that increase your chances of landing the offer and a salary increase. You don't get those kinds of results without work! If you're someone who feels truly lost about what you want in your career and you want months-long deep soul searching, personality assessments, and to come away with total career certainty, this course is likely not for you -- Week 1 of the LYDJ course helps you define your career direction, the variety of careers you could pursue, and which one you want to go after next in your life. I've included bonus exercises in case you're feeing stuck and need to take a little more time to explore and evaluate career possibilities. You can even ask me questions and get my feedback on your personal situation. But this course is more focused on learning through action, and grounded in the philosophy that there's no ONE dream job for you waiting to be uncovered. Rather, you have an opportunity to build a dream-worthy career, step-by-step, iterating as you and the world around you change, and resting assured that whatever hand life deals you, you have the skills you need to land a job you love. + What if I need support? All LYDJ participants are invited to join our LYDJ Private Members-Only Facebook Group. There, you not only have the opportunity to receive support and feedback from your fellow LYDJ members -- you also have direct access to ME. I'll be right there with you, answering your questions, cheering you on along the way, and posting weekly tips, tricks and content to make sure you're up to date on today's latest and greatest job search insights! + Do I have to complete the course in 9 weeks, or can I move faster/slower? You receive access to the entire course the moment you sign up. Some people zoom through in just a few weeks, while others appreciate the accountability and structure of weekly lessons and homework. The best news is, you have lifetime access, so no matter the twists and turns of this job search or the next, the course is there for you and you can move at your own pace. + Can I purchase LYDJ as a gift? Absolutely! Lots of people have given their spouses, kids, mentees and friends the gift of job search happiness. Just email [email protected] for easy-to-follow instructions and we’ll get your loved one started in no time. 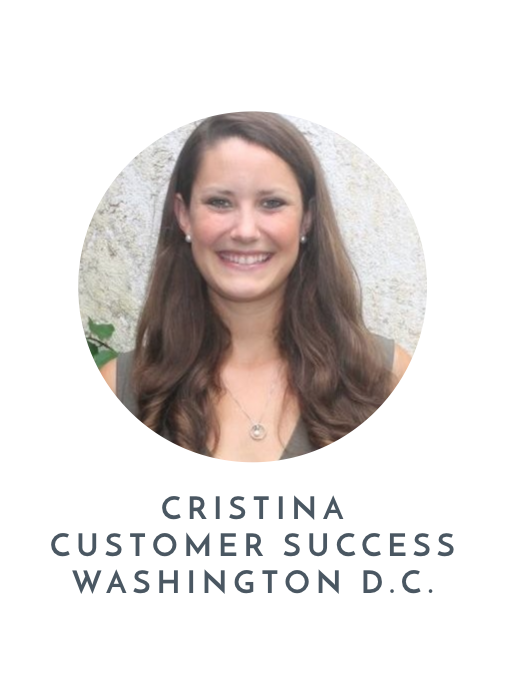 I can't wait to meet you and help you land your dream job!